By Prof Henry Garrett. 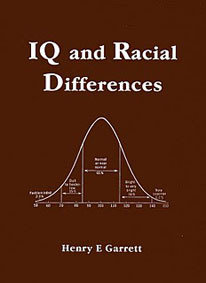 Garrett presents a lucid, concise and irrefutable brief for an educational system designed to accommodate racial variations in intelligence rather than rely on the dangerous fiction that all races are gifted with equal learning capacity. The fictional approach, heavily promoted by liberals for the past three decades, has been largely responsible for the intellectual, moral and physical turmoil now tearing at the vitals of American, and now British, schools. Dr Garrett’s forthright book provides a rational and comprehensive study of the arguments for heredity as the prime determinant of human learning. His thesis deserves careful study and attention if the deterioration of our once great Western educational system is to be brought to a halt. P/B, 57pp.